Time to swap Christmas baubles for palace balls, punch for sparkling wine, and sausages for…nope, keep the sausages. It’s New Year’s Eve in Vienna. Discover how (and where) to celebrate when visiting, what to expect at the New Year markets, and local tips on getting the most out of your year-end trip. Warning: may include waltzes. How is New Year’s Eve celebrated? New Year’s Eve is known as Silvester in Austria. It’s the Roman Catholic feast day of the same-named pope and saint, who died on December 31st, AD 335. None of which has any relevance, though, to how Vienna celebrates the turn of the year. People party just like the rest of the world, but there are one or two little traditions in Vienna not shared by such cities as New York, London or Tokyo. Just before midnight on New Year’s Eve, the main national TV station plays Dinner for One, a short comedy sketch recorded in 1963 (in English!). Then at midnight itself, the giant Pummerin bell of Vienna’s St Stephen’s cathedral rings in the New Year with the chimes broadcast across television and radio. Once the last echoes of the Pummerin cease, all hell breaks loose, as various fireworks displays across the city burst into action. Broadcasters switch to the Blue Danube waltz and everyone dances in the New Year as lights explode across the night sky. Then, just to add that last touch of romance to the evening, we all swap marzipan pigs. Seriously – they are lucky charms here. The fireworks make quite a sight (and noise), leaving Vienna a smoky haze in the early morning redolent with the smell of gunpowder (possibly just my imagination). If you want to get a good view of the fireworks over the city, then one option is to head up into the surrounding hills. Alternatively, try getting seats at the Danube Tower restaurant or Das Loft restaurant, both famous for their views. Book early. Very early. Or try other places known for great views of Vienna (the Gloriette will be inaccessible, though). 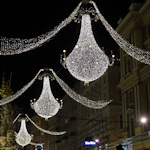 New Year’s Eve in Vienna is all about the Silvesterpfad, which translates literally as the “New Year’s Eve trail”. It’s a series of events and activities around the city centre that typically begins at 2 pm on December 31st and runs through to 2 am the next day. Last year (2018), some 750,000 people celebrated along it. The city puts up temporary stages, so live performers, bands, orchestras, and DJs can entertain the masses until midnight and beyond. The Viennese ballroom dancing schools offer free waltz courses on the Graben (the pedestrianised zone that leads away from St Stephen’s). And the State Opera House puts up a big screen outside with opera highlights. Dozens of food stands ensure you won’t go hungry or thirsty. The Rathausplatz square in front of the Rathaus town hall for a communal waltz and firework display (see photo above). It’s a grand city-wide party. Vienna is, of course, famous for its Christmas markets, but why stop there? Why indeed. A couple of these markets morph into New Year alternatives from December 27th. At the best ones, you get all the sights, sounds, smells, and (most importantly) tastes that make the Christmas versions so popular, but without the nagging sense of guilt that you ought to buy a few presents while there. Good luck getting tickets for any of these. And I don’t mean that sarcastically – a lottery system decides who can buy a ticket. You need to register at a special page on the orchestra’s website to have a chance. You’d think tickets would be astronomically expensive and some are, but prices actually start from around €20. A lot of hotels and town palaces host special Silvester gala evenings for the 31st, too. The most well-known is probably the Hofburg Silvester Ball (the Hofburg is the winter palace of the Habsburgs). Other prominent galas include the one at the Rathaus*, the dinner and concert at the Kursalon, or the gala at Palais Auersperg. Typically, the municipal transport services (Wiener Linien) extend operations for New Year’s Eve. So the subway lines run through the night at short intervals, only reverting to the normal nighttime schedule in the early hours. Many daytime tram lines and some bus lines also operate through the night, too. Given the crowds on the Silvesterpfad, the trams that encircle the city centre on the Ring boulevard and buses that go through the centre usually don’t run once the festivities are in full swing. For the same reason, the subway station “Stephansplatz” is typically closed. January 1st is a public holiday, but public holiday travel timetables in Vienna are usually better than most city’s normal timetables, so you needn’t worry about getting around on public transport on New Year’s Day.